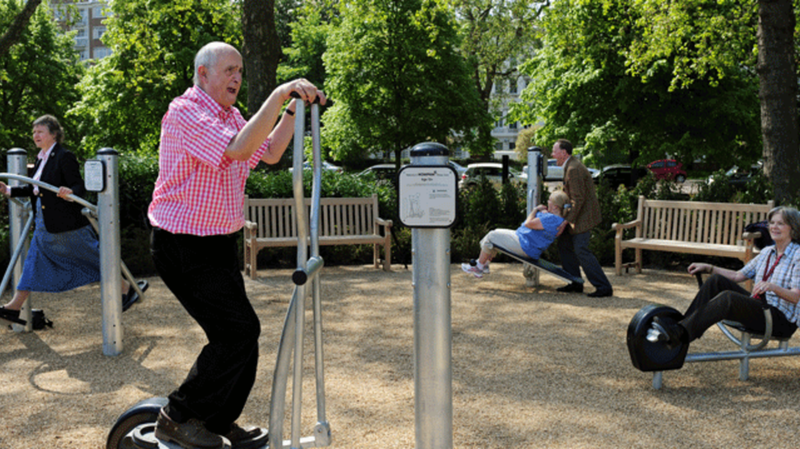 Overseas, it’s not uncommon to find senior citizens pedaling, swinging, and climbing on playground equipment designed especially for them. The first adults-only playgrounds began appearing in China a few decades ago. They’ve since caught on throughout Asia and Europe, and now they’re starting to gain popularity here in the U.S.
Companies like KaBOOM! and Must Have Play are working to make a new type of playground available to the nation's older population. The parks feature low-impact exercise equipment such as elliptical machines, stationary bikes, and hand-eye dexterity games. The activities are meant to improve balance and flexibility, and while you won’t find twisting slides or monkey bars at these playgrounds, they do sometimes include modified classics like swings and see-saws. In addition to promoting physical health, the parks provide mental and social benefits to visitors. The senior playgrounds can serve as social gathering spaces within the community and help to combat feelings of isolation and loneliness among older generations. Unlike similar spaces abroad, companies like KaBOOM! are branding their parks as “multigenerational” playgrounds meant to be used by people of all ages. These projects have caught on within the senior community in particular—after building a site in Cleveland, a representative from KaBOOM! told the Huffington Post that a group of seniors formed a fitness club there. One of their projects in Tampa transformed an outdated children’s playground into a multigenerational park, and now it’s being utilized more than ever before. KaBOOM! has constructed 53 multigenerational playgrounds in cities across America, but we still have plenty of catching up to do with the rest of the world. In just the greater Barcelona area alone, there are close to 300 parks for senior citizens (see the video below). Don't let anyone tell you that playtime is just for kids.